Published in the South Kent Gazette, 20 February, 1980. One of Dover’s domestic industries was developed in its earliest stages at No 19, and in the premises at the rear — formerly the dye-works of Messrs Scott and Son. Those were established in the mid 1850s and No 19 remained a depot of the business for many years although the factory moved lower down at 95-100 Snargate Street. For many years the business was managed by Mr David Bradley, a former chairman of Dover Magistrates — from 1955-1969. He joined the firm in 1920, became managing director a few years before the last war and continued in that post until the business was sold in 1963. Educated at Dover College and Leeds University, Mr Bradley, who lived at Kearsney, was the grandson of John Scott. Nephew of Sir Montague Bradley, who was Liberal candidate for the Dover constituency in 1910, he followed in his grandfather’s footsteps in 1959 by becoming chairman of the Dover Liberal Association. His grandfather held the post in 1875. He was also a devout member of the Baptist Church being a deacon for a number of years of Salem Baptist Church and Superintendent of the Temple Ewell branch of the church. He was at one time President of Dover Chamber of Commerce and served as the last chairman of the old River Without Parish Council. The modem frontage of the property which stood at No 20 until the Hitler war intervened (Beney and Buckland, ladies’ and children’s wear) dated from the big blaze which took place on the night of 5th January, 1880. Between Nos 21 and 22 was the room for many years used for public meetings and entertainments, known as the Wellington Hall. This Hall, and the adjacent premises, so long occupied by Messrs Houlden, drapers, (listed in street directories as far back as 1875 and probably earlier) was, in the first half of the 19th Century, the home of Squier’s Bazaar, mentioned in the "Ingoldsby Legends“ story of “The Monster Balloon.“ There was an arcade which ran through to Northampton Street. The Wellington Hall has served many purposes. It was the first home in Dover of the Salvation Army, the headquarters of the Navvy Mission during the building of the Admiralty Harbour, and, with the advent of the cinema, was transformed to that use. A well-known Snargate Street shop in the early part of the last century was No 22, the Hong-Kong Tea Stores, kept by Mr John Blackman, and subsequently by Mr Frederick Samuel Peirce, who was a Volunteer officer and a Magistrate; he was Mayor of Dover two years, and, while in office, received and congratulated Captain Webb after his pioneer swim from Dover to Calais in 1875. 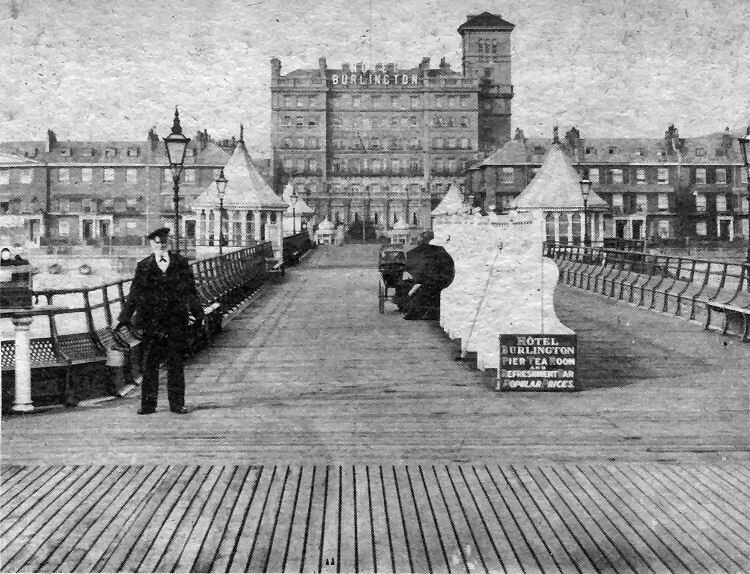 A victim of Hitler war damage, the majestic Burlington Hotel as viewed from the long gone Promenade Pier. The hotel appears to be on the seafront, but the camera lies. 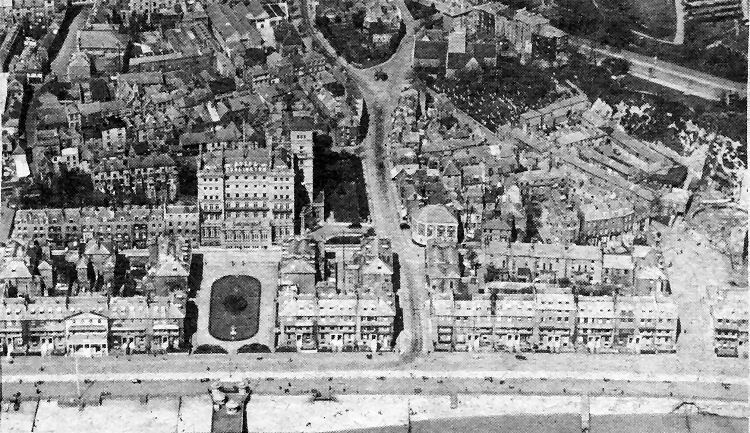 Most if not all the building was on the landward side of what we know today as Townwall Street, as will be seen by the aerial picture above of about 1929. In the centre is Woolcomber Street and extreme right, with Marine Court in front, can be made out the foundations of the gasometer of the old Trevanion Street gas works. 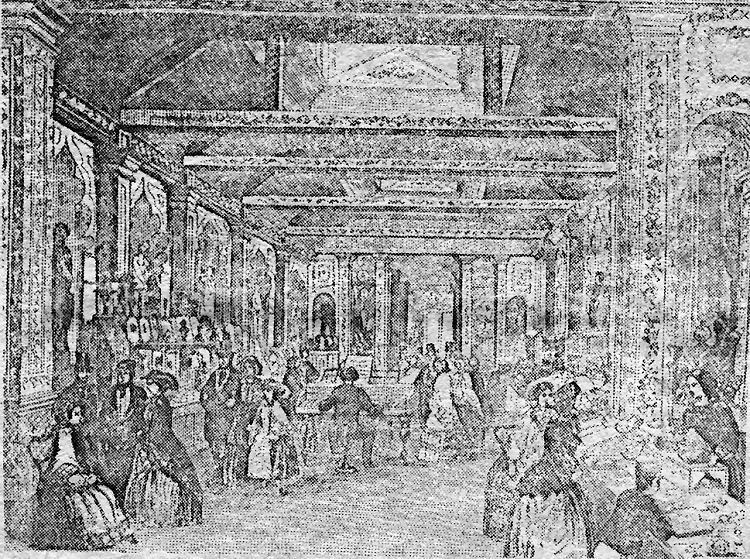 The above is an engraving, of the 1860s, of the ornate Wellington Hall interior.